OUR NEIGHBORHOOD ISSUES are not going away. Meth is still a huge problem. Last night, two blocks from where we live, police busted a house and arrested a Quincy man for making meth. He's right next door to a guy I know and right across the street from another couple we know, a couple raising their young grandchild. QPD also arrested an 18-year-old yesterday for an assault and robbery. I'm pretty sure I've seen him at a house just down the street. There are all kinds of, uh, interesting people living there. They are friends with others around the other corner. They are also, uh, interesting. As citizens, we can't take the law into our own hands. But we can be vigilant. We can report suspicious activity. We can be good neighbors and keep an eye on things. Let it be known that in Calftown, if you want to be a dirtball, we will be watching you. That's a promise, not a threat. Idiots are idiots and they don't care. But we do. That's our advantage. And the bad guys won't win. 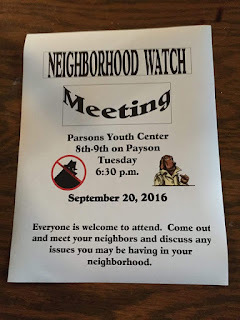 There is a Neighborhood Watch meeting tonight. Store and my Whig commitments might make it tough to get there. But I think it's important, and please, if you do go, bring your concerns and ideas, NOT your conspiracy theories and insipid stories about lights being left on. In Calftown, the lights are always on.